Playing at a World Cup in the Caribbean one month…umpiring national finals in Australia the next. 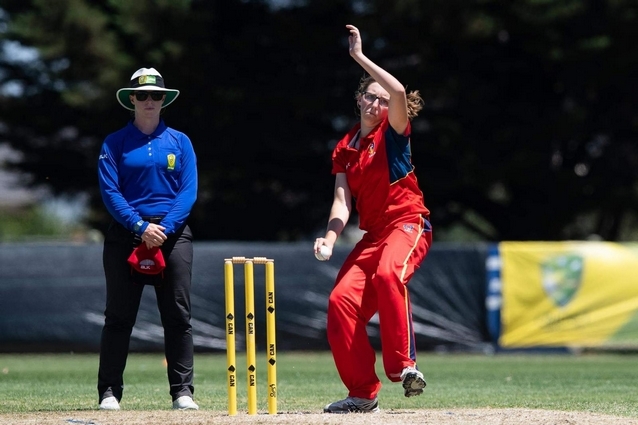 Mary Waldron’s umpiring aspirations continue to grow as she stands in the Cricket Australia Under-18 National Championship Final this week. Last year we highlighted Mary’s growing interest in cricket umpiring, at the time spending her second full Australian season with the South Australian Cricket Umpires Association. Her umpiring reputation both home and abroad has grown further since then, and in August 2018 she became the first Irish woman to stand in a Men’s List A match. Now, at the start of 2019, Mary is back in Australia once more, and this week was selected to stand in the Final of the Under-18s National Championship. She stood in the tournament last year for the first time, but to be handed the duties for the final is a credit to her progress. This appointment was off the back of umpiring in the Final of the Twenty20 National Championships last week in Bendigo. Back on the playing side, Mary was this morning named in the 2019 Ireland Women’s international squad and is set to play an important role on the field in what is shaping up to be a big year for women’s cricket in Ireland.